The "flash crash" of May 6 was a day of reckoning of sorts for investors in exchange-traded funds. "ETFs are relatively new, and not as simple and straightforward as we have been lulled to believe," says Rose Greene, a certified financial planner with Rose Greene Financial Services. About 20% of ETFs were at least temporarily snarled in the trading glitches that took place that day, according to Morningstar (MORN). 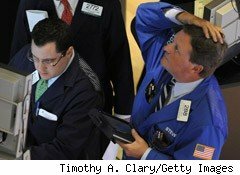 Meanwhile, a separate report by indexuniverse.com that analyzed lists of trades canceled by the NASDAQ and the New York Stock Exchange after the market stumble says that more than half the securities on those lists were shares of ETFs rather than individual stocks. At some point on May 6, about 210 of 980 ETFs changed hands at a prices more than 50% below their ultimate closing price, according to Morningstar. There were reports of strange results: Shares of the $11 billion iShares Russell 1000 Growth ETF (IWF), traded at one point for a penny; the $2.7 billion Vanguard Mid Cap ETF (VO) and the $5.3 billion iShares S&P 500 Growth Index (IVW), both traded for 10 cents. "The early word is that ETFs didn't cause the meltdown, but that they were the victims," says Tom Lydon, president of Global Trends Investments. "70% of all canceled trades were ETFs, and 25% of all ETFs lost more than 50% in price during that 20-minute period." But the fallout for investors was dependent on whether the shareholder was a long-term investor or day trader with a stop loss order -- a pre-set order to buy (or sell) a security once its price has climbed above (or dropped below) a specified stop price. "The flash crash lasted for about 20 minutes," explains Greene. "If you didn't sell shares during that time then the impact was mostly neutralized very quickly and by the end of the day the market was down, but not due to the crash. On the other hand, if you were a day trader with your hands on the keyboard or had a stop loss order that was automatically triggered after it hit that price, then you might have sustained a loss." Many investors who had stop losses with "good 'til cancel" orders saw those positions sold at hefty losses. Another cause of loses: Using market orders -- orders to sell at the going price -- instead of limit orders, which are orders to sell at a specific price, points out Lydon. "Limit orders vs. market orders: There's still some education that needs to take place," he explains. "Many investors and advisors still don't know how to use them. Some didn't understand the difference and the value of having a limit order vs. a market order. Had limit orders been in place, advisors and investors could have decided whether they wanted to sell as the market was crashing. With market orders, the orders went through automatically." ETFs Are Baskets of Stocks ... But What's in the Basket? It seems like ETFs were the whipping boy in the May 6 drama. But in reality, what took place with the funds was the same as what happened with equities, just on a magnified scale, says Lydon. ETFs are baskets of stocks -- if one stock drops 60%, that's one thing. But when individual securities couldn't be accurately priced, the ETFs that held those securities couldn't be accurately priced either. "Unfortunately, sell market orders continued to hit the exchanges without defined sell limit prices and they were filled." Another curiosity from May 6 is the fact that none of the canceled trades were of shares of actively managed ETFs, according to Noah Hamman, CEO of AdvisorShares, which offers actively managed ETFs. "No one has really been able to identify why one ETF was more impacted than another," he adds. While the jury is still out concerning what triggered the May 6 meltdown, "It certainly was not caused by a fat finger hitting the wrong key," says Greene. "The best guess right now is that one trading firm placed an abnormal large sell order. That triggered other selling by computer trades, which caused an imbalance between sellers and buyers, and there was no system-wide braking mechanism." The Securities and Exchange Commission announced this week that U.S. exchanges and the Financial Industry Regulatory Authority are filing proposed new circuit-breaker rules. Under the proposal, the markets would briefly halt trading in certain individual stocks if their prices move 10% or more in a five-minute period. Initially, the new rules would be in effect on a test basis through Dec. 10. "The pilot program does not include ETFs, but will help them and eventually may include ETFs," says Hamman. There's no doubt that ETFs showed a bit of vulnerability at a time when their popularity continues to soar, but that doesn't mean necessarily that investors should retreat, just open their eyes a little wider and make a couple of adjustments. The best way to mitigate risk is to have a strategy in place at all times and to use it, says Lydon. "We use a trend-following strategy: When a position is above the 200-day, it's a buy signal. When it's below, it's a sell signal. We also use an 8% stop loss: When a position drops 8% off the recent high, even if it's still above the 200-day, it's a sell. The other way to mitigate risk is to always use limit orders -- not market orders!" he adds. Limit orders put the control of when and at what price you sell back in your hands; market orders sell at any price you can get, and that won't always work in your favor, says Lydon. The May 6 glitch occurred when the market was particularly vulnerable on a technical basis. "Fundamental investors often think that technical chart patterns don't matter, but when you have enough investors, traders and participants following a trend, technical patterns matter," says Dan Weiskopf, principal of Global ETF Strategies at Forefront Advisory. Know too, that "good 'til cancel" orders might burn you. "Those sell orders in the crash were triggered at the market price, which in many cases was far below the price those securities were at just minutes before," says Lydon. Prior to the Flash Crash, investors were feeling residual nerves from the market meltdowns in 2008 and 2009; May 6 only deepened that nervousness. "They're very upset and many of them suffered big losses when the Dow dropped 1,000 points. It may take awhile to restore the trust in the systems that operate the markets, but the SEC is pushing out new rules that should help bring back some confidence. Investors want to know that they're protected," says Lydon. Perhaps the biggest lesson for investors in all this is keep your cool. "Don't panic, even when the alarm bells inside you are going off," says Lydon. "Investors who panicked when the crash happened in the absence of real news to justify such a drop were hit hard. Many of those losses may have been fueled by panic selling."